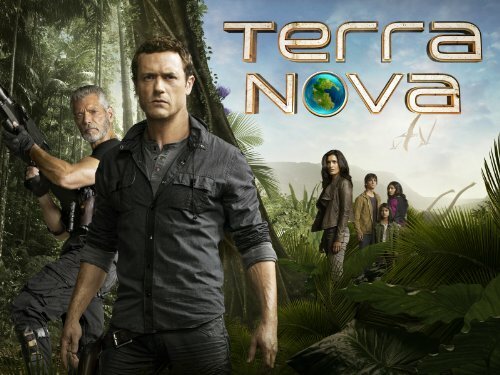 Quick Take: Terra Nova, "Pilot"
(S0101) A family travels back in time through a mysterious time rift to a prehistoric world filled with dinosaurs. Land of the Lost, right? Not any more. 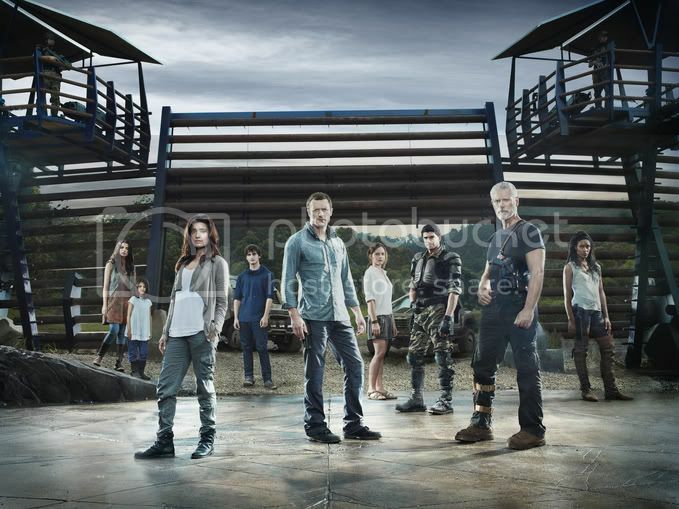 With a budget I’m conservatively estimating to be about a bazillion times bigger than the cheesy but fun '70s television show, as well as involvement from heavyweight executive producers Steven Spielberg and ex-Fox CEO Peter Chernin, Terra Nova is set to descend on FOX this September. The pilot opens with the introduction of an earnest cop named Jim Shannon (Jason O’Mara from Life on Mars), a devoted father with a lovely wife named Elisabeth (Shelley Conn) and three kids at home. Unfortunately, population controls are strictly enforced in their bleak, dystopian future world (is there any other kind? ), with families being limited to a maximum of two kids due to dwindling resources. When a police team shows up at their door to search for extra kids, Jim attacks them and ends up in the slammer for a couple of years. At that point, Elisabeth visits him in prison to announce that she has been selected for the highly competitive Terra Nova project due to her career skills as a scientist, then slips him a hidden laser so he can try to escape. The Terra Nova project is a colonization effort to save the human race, with selected candidates going on a pilgrimage through a time rift to the past. Nobody can come back through the rift, it only goes one way. This makes Jim’s escape from his high security prison and into the high security time portal crucial if he’s to have any hope of continuing a life with his family. There’s also the small matter of how to smuggle their third child through the rift, which they solve by stashing her in one of their large backpacks. Sure enough, they succeed on all points, dashing through the rift and into a lush, green world filled with so much oxygen that they have to wear breathing masks of good old dirty air while they acclimate. Their colony is ruled with an iron fist by tough-as-nails Commander Nathaniel Taylor (Stephen Lang, Avatar), and he doesn’t take kindly to the Shannons smuggling in Jim and an extra kid, but since they’re there and can’t go back he assigns Jim to agricultural duty with no restrictions and lets the whole family live together. Meanwhile, Elisabeth starts her scientific duties and teenage son Josh gives his parents attitude and mingles with the local teens. Those teens lead him OTG (outside the gates), where he goes swimming in a river and explores odd inscriptions all over the rocks. Back at camp, Jim has a chance encounter with a man-sized centipede during his gardening duties, while his youngest daughter makes friends with a gigantic brontosaurus that leans its head over the wall to eat some leaves she’s holding. Other than some enhanced scenic vistas, a few other dinos, and the time portal energy, I don’t recall any other effects, so not really sure where all of their budget went other than set design and paying off around a dozen executive producers. Yes, I counted. Ex-cop Jim notices a sketchy character making his way through camp, so he decides to tail him and comes to the rescue when the guy tries to assassinate the Commander. That leads Nathaniel to take Jim into his confidence a bit, going on a quick trip outside the camp where they spot a few unfriendly jeeps headed their way. Nathaniel advises Jim that the assassin and the people in the jeeps are Sixers, aka the sixth group of colonists, who broke off from the main camp and formed their own alternative society due to undisclosed reasons. Suddenly, a group of “carnos”, carnivorous dinosaurs, attacks the jeeps, with one munching down on a gunner while the rest of the humans try to get away. Everyone else makes it back to camp successfully, and the first hour closes with a Sixer leader approaching Nathaniel for a seemingly peaceful discussion. I’m not completely sold on O’Mara as the lead, but Shelley Conn is fantastic as the mom and Lang puts his tough military guy Avatar shtick to good use again. I’m also not completely sold on the show, but after an hour it’s more promising than Spielberg’s other sci fi exec producing effort this year, Falling Skies. There's plenty of room to explore the dynamics of the two opposing camps, the interactions with the various types of dinos, as well as that pesky time portal that can deliver fresh threats from the future at any time. However, based on the massive budget and minor commitment (13 episodes), it’s hard to imagine this show surviving to season two. Enjoy the weekly dinos while you can this fall. O’Mara is Irish and Conn is English, so why does O’Mara use an American accent while Conn gets to keep her own? The two youngest daughters clearly look like the mixed race offspring of the parents, but the oldest son is about as white as they come, so is he only Jim’s son? I thought the cops found the third child during Jim’s arrest, so why were the Shannons still hiding her two years later? How does the Commander have full personnel records of Jim’s past life when Jim wasn’t supposed to be there? Whether or not the concept can hold up remains to be seen, but in short this show looks freaking cool !